Garlic Bread Recipe (How to Make Garlic Bread) – Buttery, garlicky, crunchy and addictive! I will teach you how to make the easiest homemade garlic bread recipe with a delicious garlic bread spread from scratch. I didn’t grow up eating homemade garlic bread. My mom was just too busy for that. Between a 9 to 5 (sometimes 9 to 6 or 7) job, a husband and two demanding kids in numerous activities, she was spread pretty thin. Looking back, I seriously have no idea how she was able to cook dinner for us at least 5 times a week! I guess she just managed to make things convenient so they worked for her. If garlic bread was served, it was served from a frozen box labeled Texas Toast alongside her famous spaghetti at dinner time. Then one day, something happened. Our local grocery store started selling homemade garlic bread in their bakery section. My mom decided to try it out and brought home a sliced loaf that looked really delicious even in non-baked form. She popped it in the oven as she was finishing her famous spaghetti and something magical occurred at dinner. I was totally changed! Texas Toast was kicked to the curb. I had no idea homemade garlic bread could be so delicious and easy to make. You could say I became a bit obsessed with it. I probably asked my mom to buy this bread at least once or twice a week. Sometimes I would deceptively place it in the shopping cart behind bigger items so it would make it to the check out counter. After eating factory produced garlic bread for so long, the taste of fresh bread topped with butter, minced garlic, olive oil and parsley was divine and a real eye opener. bread and never turned back. Now it’s time to teach you how to make garlic bread! I created a recipe for garlic bread that was perfect for my busy lifestyle but also utterly delicious. This doesn’t take me long to make at all. I simply slice the bread, make the garlic butter spread, and bake it to perfection as I finish my famous spaghetti – which of course it’s my mom’s recipe. WHAT BREAD IS BEST FOR GARLIC BREAD? To begin, make sure you start with a quality baked bread. I love to grab a nice baguette from bakery section of my grocery store. You can either go for French or Italian baked bread but fresh is key. For the butter, I like to go for a french style butter that has more butter fat because it is creamier and more decadent in taste. Fresh garlic and herbs are essential for this to taste even better. For those who are wondering about the garlic powder in addition to the minced garlic, I find that the taste allows for more garlic in each and every bite. WHAT DO YOU EAT GARLIC BREAD WITH? This bread is seriously fantastic served with my Italian pot roast recipe, this brown butter pasta, this chicken piccata recipe, this stuffed shells recipe or my lentil meatballs and spaghetti recipe. 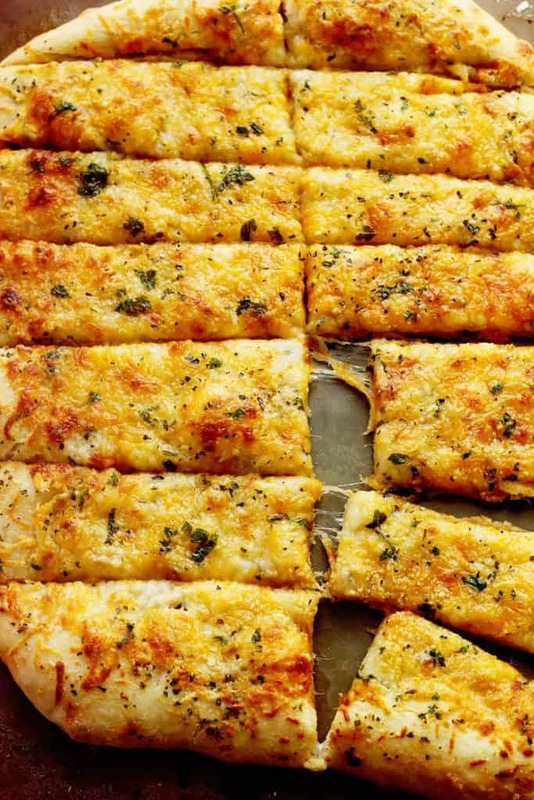 Also check out these Garlic Cheese Breadsticks!!!! They are so wonderful for a cheesy twist on the classic. Garlic Bread Recipe (How to Make Garlic Bread) - Buttery, garlicky, crunchy and addictive! I will teach you how to make the easiest homemade garlic bread recipe with a delicious garlic bread spread from scratch. If you want to brown the top even more, turn your broiler on for 1-2 minutes but watch carefully so your bread doesn't burn!! Made it without the parmesan cheese. Very yummy! I also make it without parmesan too! I was looking for a garlic bread recipe and found yours. It’s to die for , love it as does my crew !!! Am I missing something? I see that you have Parmesan listed as one of the ingredients but I didn’t see the amount listed in the ingredient list. It’s an optional ingredient. I actually make it without the parm. Put as much in it as you want or none at all anyone has to ask in regards to that ingredient in this particular dish obviously has no clue about cooking stick with Texas toast..! This garlic bread went great with your Italian pot roast recipe! Thanks for both!! Looks yummy, How much Parmesan cheese? I never add more than a tablespoon or two because it is stronger but i would taste and see if you like a lot or not. So good, thanks for the recipe! Hooray that makes me so happy! Oh YUM! This looks like an amazing recipe! Totally trying it soon!